Why should you choose Elemental over Enhancement? While the latter is king at mana efficiency damage output wise, most of its damage is single target. While Elemental may have slightly more downtime and less single target burst, it makes up for it with its superior AoE, which comes in very handy while leveling. Despite AoE grinding nowadays being less efficient than leveling, you will still have the ability to breeze through the "kill x amount of monsters" quests and the bonus experience from killing a packs of mobs won't hurt you either. Always take weapons with the highest spell power. - Use Earthliving if you know you are going to heal in an instance. - Just heal yourself with Lesser Healing Wave whenever you need to heal. - If you're multi-pulling, use Stoneclaw Totem to crowd control. - You can also pop your Spirit Wolves to help with packs, since they can heal you. The best options money wise are Skinning/Mining because they make lots of money on the Auction House. Skinning also gives critical strike rating and mining gives extra stamina, which scales with buffs like Blessing of Kings. These bonuses are small but noteworthy for end-game min/maxers. Spell power should be your main focus in gear, as it directly increases the damage you do with your spells. Intellect and critical strike are also valuable for adding to you damage. Hit rating is much less of a focus while leveling than in endgame content, so don't fret over this, but having some will help you hit your enemies more often, which is especially useful with higher level enemies. Due to the talents and Water Shield procs, you will rarely be running out of mana, and as such mana per 5 should be at the very bottom of your list of priorities. Your preferred gear should be mail and 1h + shield. 1. Spell Power/Damage: Directly increases the amount of damage that your spells do. 2. Intellect: Increases your maximum amount of mana. Also adds to your spell critical strike chance. 3. Critical Strike Chance: Increases your chance to cause critical strikes with your spells. 4. Hit Rating: Increases your chance to hit enemies. Useful but unnecessary to focus on while leveling. 5. Mana Per 5 Seconds: You won't see this a lot until Outland, but Water Shield gives this as well. It basically gives you a certain amount of mana every five seconds. Since patch 3.0, the mana gain flows smoother and in quicker intervals than "every 5 seconds". The term "MP/5" is still used, however. Heirlooms bind to the account, as opposed to an individual character. This means they can be mailed to any character that shares the same account and server, including those of opposing faction. If you by accident accept the quest that teleports you to the top of a mountain, don't be afraid; just jump off the wooden plank and you will get teleported back to the quest giver! Click here for a full list of Shaman glyphs. Glyph of Ghost Wolf or Glyph of Water Breathing - Your choice. Call of Elements - It's an addon that creates new bars for your totems, tells you when your totems are going to expire and/or are destroyed, and when your weapon enchant expires. ShieldsUp - It's an addon that helps you with refreshing your shields by telling you when your Water/Lightning/Earth Shield fades. 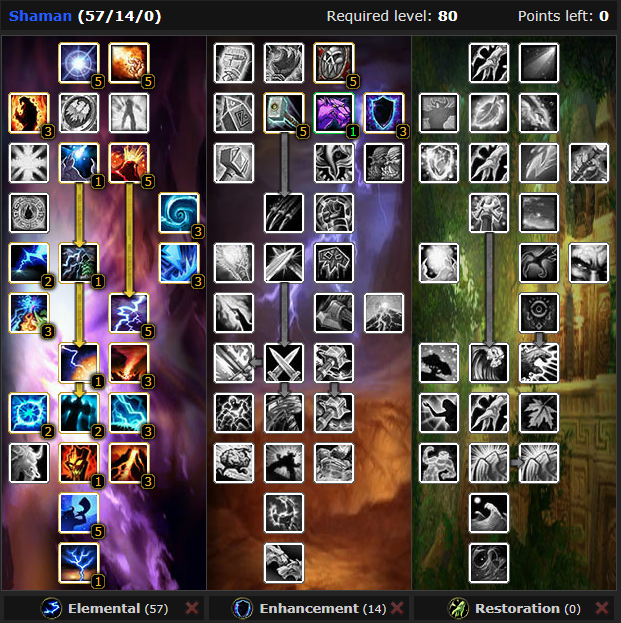 Click here for a full list of shaman addons. RatingBuster - The design aim of RatingBuster is to provide detailed, meaningful and customizable information about items and their stats so you can easily decide for yourself which items are better for you. Crap Away - Crap Awat adds a button to vendor-windows which, if clicked on, sells all the grey items you have in your inventory. XBar - Xbar creates action bars for useful things, such as Track spells (for hunters), Buffs, Companions, and of course, Totems! ArkInventory - Arkinventory is a bag addon, which allows you te create seperate windows for different kinds of items (basically, it creates several virtual bags). It also shows the vendor price of items.